The North American Equine Ranching Information Council is a non-profit association of equine ranchers engaged in horse production and management of pregnant mares. Estrogens extracted from pregnant mares' urine (PMU) are used in production of hormone therapies for menopausal women. NAERIC serves its members, the horse industry and general public as an agribusiness resource by providing the latest information and research on ranch management, equine care, breeding practices and innovative marketing programs. The council is dedicated to ensuring the NAERIC brand represents overall quality. NAERIC supports and promotes the partnership between agriculture and women's health care. NAERIC's office is located in Louisville, Kentucky (USA). The mailing address is P.O. Box 43968, Louisville, KY 40253-0968. Phone: 502-245-0425. Fax: 502-245-0438. PMU contains the estrogens used in the production of Premarin®, (conjugated estrogen tablets, USP), the world's leading hormone therapy for post-menopausal women. Millions of women around the world use hormone therapy. The production of Premarin® unites experienced horse breeders with the expertise of a leading pharmaceutical manufacturer in a unique partnership between women's health care and agriculture. Premarin® was introduced in 1941 by the Canadian pharmaceutical company, Ayerst, McKenna and Harrison, Ltd. (now part of Pfizer). The family-owned ranches contracted by Pfizer to collect PMU are all within reasonable proximity to Pfizer, located in Brandon, Manitoba, Canada, where the initial processing occurs. The multiple step process to extract the estrogens from PMU to produce Premarin is one of the most sophisticated in the pharmaceutical industry. No urine remains in the unique combination of natural hormones in the product. Aren't there other synthetic generic forms of estrogen replacement therapies available to women? The scientific evidence is clear; all estrogens are not the same. It is important to point out that Premarin® is the most widely studied estrogen therapy product in the world. More than 3,000 scientific studies of estrogen have used Premarin® —studies that have helped health care providers to better understand the benefits and risks of estrogen therapy. How many broodmares are there in the equine ranching industry? There are approximately 1,300 broodmares involved in the equine ranching industry. 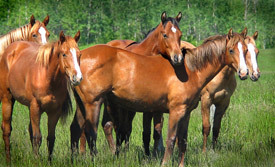 What kinds of horses are involved in equine ranching? Quarter Horses are the most common registered breed found on equine ranches. They outnumber the next most common breeds, registered draft Percheron and Belgian horses, by a 2 to 1 margin. A variety of other less dominant breeds are also involved in the industry including Paints, Appaloosas, Standardbreds, and Thoroughbreds. How long has the equine ranching industry been in existence? The equine ranching industry has existed since 1942.
Who are the equine ranchers? Most equine ranchers are fourth generation horse breeders who own their own horses. They are involved in the care and handling of horses for a variety of purposes other than PMU production. What is your response to animal activist allegations? The industry has taken the allegations made against us very seriously. We have endeavored to identify the best veterinary minds and organizations available, in order to objectively and fairly review the industry and its management practices. We have invited the American Association of Equine Practitioners (AAEP), the Canadian Veterinary Medical Association (CVMA), and the International League for the Protection of Horses (ILPH) to access the industry, and provide input and guidance for the future health and welfare of the horses under our stewardship. Equine ranchers are dedicated to utilizing the most advanced animal husbandry techniques, ensuring that their horses receive high-quality care and attention. The industry operates under a science-based management practice approach and is eager to identify management changes, which will further identify a "best practices" approach to caring for their horses. We have not adopted arbitrary, prescriptive standards. Practices not driven by sound science will cause disruption to the management of horses with little, if any, practical improvement for the industry. Equine ranching has more checks and balances to ensure animal care and welfare than any other livestock industry, making it one of the most regulated and closely inspected equine-related activities in the world. It is important to note that virtually every knowledgeable equine professional who has been involved with the industry has recognized the outstanding care given to these horses. The mares' urine is collected using a loose-fitting, flexible, light-weight pouch that allows for a full range of movement, including lying down. 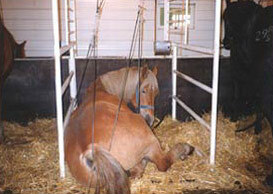 It is held in place by a system of pulleys and is not directly attached to a mare. Is water restricted for the mares? No. The mares receive ample water according to the Recommended Code of Practice for the Care and Handling of Horses, which is based upon the guidelines published by the National Research Council (NRC) nutrient requirements of horses. Why don't the horses have access to water all of the time? Horses are watered utilizing automatic watering systems. Ranchers provide all of the water their horses will drink, at least five times per day. Most ranchers water more often. The automatic watering systems ensure horses receive fresh water multiple times each day. Ranchers' contracts are in grams of estrogen, not unit volume of urine. The pharmaceutical company pays for transportation of the PMU to the processing plant. This system provides no incentive to do anything other than manage the horses according to acceptable standards, not the least of which are the National Research Council's Nutrient Requirements of Horses. Would the foals be more valuable if the mares received better treatment while they are pregnant? Equine ranches have undergone many state and provincial reviews conducted by individuals representing animal welfare groups. They have found our horses to be healthy and well cared for. United States Department of Agriculture inspectors visited PMU ranches in March 1994 and reported that "…allegations of abuse and inhumane treatment were unfounded." "American Veterinary Medical Association (AVMA), American Association of Equine Practitioners (AAEP) supports pregnant mare urine management." JAVMA, Vol. 212, No. 11, June 1, 1998. The value of the foals is extremely important to the ranchers because it is a primary source of their livelihoods. In addition, assisting the ranchers in improving the value of their horses is a primary focus of NAERIC. 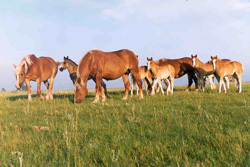 Today, many ranchers are breeding registered horses. The majority of registered horses are Quarter Horses, Paints, Appaloosas, Percherons, Belgians, and Clydesdales. Why are the mares confined in such a small space? The horses are able to move relatively freely in their stalls and are able to lie down comfortably while wearing their collection harnesses. It is important to understand, too, that most adult horses spend the vast majority of their lives standing. Most even sleep standing. In addition, a study published in the American Journal of Veterinary Research (AJVR), Vol. 60, No. 11, November 1999, showed that the tie stall environment in which most PMU mares live during the collection season is actually superior to box stalls considering the social nature of these herd animals. The study also found that behavioral parameters of PMU mares in tie stalls are normal, if not better than, what is reported for the horse industry at large. How are the mares impregnated? Mares conceive naturally. When they are turned out to pasture in the spring, they live just as they would in the wild, in bands that include 10 to 20 mares and one stallion. The breeding season lasts during the early summer and fall; as close to mother nature as it gets. Breeding occurs as it would in the wild, and as a testament to the health and well-being of the horses, PMU mares have some of the highest conception rates within the horse industry. Is it true that the mares are kept pregnant 11 months each year for many years in a row? Eleven months is the normal gestation period for horses and it is simply instinct for them to reproduce annually. During the natural course of their lives, mares are capable of conceiving and giving birth many times. In fact, if a mare were to foal many times in her life, it would be a testament to her health and strength as well to the care she has received. How much time do the mares spend confined in the barns? Urine collection begins in late fall and runs through late winter, so the mares are stabled during the winter months when the temperature often drops to minus 40 degrees outside the barns. All ranches are required by the Code of Practice to maintain exercise programs tailored for the needs of each animal in the barn during the collection system. Aren't PMU foals weaned when they are too young to be separated from their mothers? 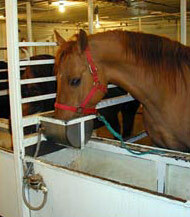 Weaning is a normal part of the life cycle for all horses on farms and generally for all types of livestock as well. They are weaned at approximately four months of age, which according to many equine experts is the optimum weaning age. What happens to foals produced on equine ranches that are under contract to produce PMU? 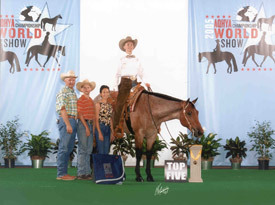 Virtually all the horses are registered with traditional breed associations. The vast majority of the foals then are sold each year for a variety of purposes such as recreational riding, working ranch horses, horse shows and other competitions; others remain on ranches for future use by ranch owners. What are some things NAERIC has done to promote PMU foals? The NAERIC Advantage® is a value added program for horses bred on NAERIC member ranches and registered with NAERIC. More than 52,000 horses are registered with NAERIC and are eligible to earn NAERIC Advantage® rewards. NAERIC horse owners, have received over $3,200,000.00 in payouts since the incentive program was begun in 1998. Click here for complete NAERIC Advantage information. NAERIC CanAm Sport Horse Program. CanAm Sport Horses is a program of the North American Equine Ranching Information Council (NAERIC). CanAm Sport Horses, blending quality with affordable prices, are produced by crossing predominantly draft-cross mares with Thoroughbred stallions that meet the needs of sport horse enthusiasts from the show ring, to the hunt field, even recreational riding. With their exceptional disposition, durability, athleticism, versatility and color, CanAm Sport Horses are registered with NAERIC. 4-H Young Horse Development Project. Participating equine ranchers offer 4-H members a selection of weanlings to inspect, judge, select, purchase, raise and train. Participating 4-H members obtain hands-on experience, assume the responsibilities associated with horse ownership and develop skills required for setting and achieving goals. NAERIC Draft Horse Classic Sale and Futurity. Breeders of quality draft horses are members of the NAERIC Draft Horse Classic committee and participate in this unique program. This program entitles breeders to consign and sell two registered or non-registered yearlings at auction each spring. The horses sold through the sale return after training to compete for a significant purse at the futurity designed to demonstrate their quality, conformation and performance. The NAERIC Versatility Ranch Horse Stake is a stake class held in conjunction with an AQHA approved show or special event for registered Quarter Horse, Paint Horse and Appaloosa three-year-olds sired by NAERIC-member owned stallions. NAERIC registered foals, by a nominated stallion, are eligible to compete. The highest placing horse by a nominated stallion will receive the 1st place purse, followed by 2nd placing horse, etc. NAERIC Barrels of Cash Sale and Futurity. NAERIC launched NAERIC Barrels of Cash Sale and Futurity in 2008 to reward and recognize the quality, versatility, athletic ability and disposition of NAERIC registered horses. Only foals sold through the NAERIC Barrels of Cash Sale will be eligible to return and compete as five-year-olds in the NAERIC Barrels of Cash Futurity. Consignors will pay $250.00 to the Futurity purse for each weanling sold. All Sale weanlings will be NAERIC registered and eligible for rewards through the NAERIC Advantage.